Members interested in playing in this league are asked to sign up now by emailing Chris Garner at chrisg162@gmail.com. Due to constant changes I will be updating the Ladder on Fridays from this point on. 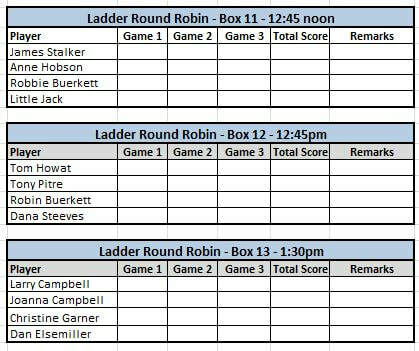 Ladder Update - There is still room to accommodate more players. Please let me know by email before Friday if you cannot play & I will slide you out (to retain your current ranking) When you want to return to playing then again please let me know by email and I will slide you back in. A no-show is anyone who has not informed me by email prior to the Friday before play or get a sub to play in their place. The initial ladder placement/rankings are estimated by the Ladder Organizer (LO), with assistance from the executive if so desired. Placement is not critical since ladder play will eventually sort out rankings. The LO has the sole determination of where any new player will be placed into the ladder, with assistance from the executive if so desired, regardless of the new player's opinion.